Leong Sze Hian suggests ways to monetise your flats for retirement. I refer to the article “I can’t take the flat with me when I die” (Today, Mar 2). In the example cited by Today, a 62 year old male with a 3-room HDB flat, will get $5,000 cash and $5,000 to his CPF, followed by a lifelong monthly income of $530. In a normal reverse mortgage, the home-owner draws income and is charged interest. On death, the market value of the property is offset against the amounts withdrawn plus interest owing to the financial institution. Assuming an interest rate charge of five per cent, the sum owing after 30 years is $465,274. If the value of the flat appreciates at 5 per cent, the market value after 30 years is $1.02 million. So, does it mean that in a sense, the flat-owner may lose $554,726 ($1.02 million minus $465,274)? Wouldn’t the flat-owner be better off renting out one room for about $450, and retain the equity on the flat? With inflation, it is also likely that the one-room rental may increase in the future. Of course, one can take the lease buyback scheme as well as rent out a room, to receive a total monthly income of about $1,000 for a start. 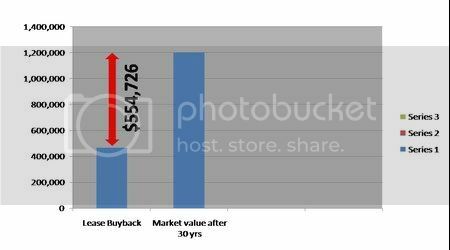 The lease buyback scheme may be a better arrangement than a reverse mortgage, as it takes away the uncertainty of how much a flat may be worth in the future and interest rate fluctuations in a reverse mortgage. For example, if the return on the 3-room flat valued at $236,000 is three or four per cent per annum, the value after 30 years is only $572,834 and $765,442 respectively. Historically, I understand that HDB flats have always increased in value as there has always been upgrading to new flats under the Selective En-bloc Resettlement Scheme (SERS), for older HDB flats that reach around 40 years old. The HDB is in effect, taking the risk that no financial institution will take, of paying $114,000 up-front, which at say five per cent interest, means that it will cost $492,701, to buy the balance 40-year lease of the 3-room flat after 30 years. There is also no risk for the flat-owner, of having the amounts withdrawn plus interest exceeding the value of the flat. In this connection, recent media reports highlighted the first case of a private property reverse mortgagor losing his property after only about 10 years. Assuming a rate of return of say 4 or 5 per cent, the $166,000 sale proceeds can give a perpetual monthly income of $553 or $692 without consuming any of the $166,000 capital.